Nobody will come just because you created something. That isn’t how it works unfortunately and you should be glad it doesn’t work that way. If it did everybody’s attention would be spread around. You want to build an audience that pays attention to everything that you do because they love what you do. This is your tribe and in this post we are going to talk about the 5 keys to growing your own. Before we talk about the 5 key values, first I think it is important that we bring up the obvious stuff. Like if nobody is coming to your site then there is no way you can grow anything. I know you know this, but I wanted to make sure it’s crystal clear. If you aren’t sure how to get past this first hurdle, then check out 9 Easy Ways to Grow Your Blog. That will get you started. Next, when you start to get people to your site you will experience some growth. However, if you want to experience real growth then you need something else to happen. Exponential growth happens when your audience shares what you do with their own audience. Of course, these sound great in theory because they are just one word, but how do you apply them? You know I got you covered so let’s begin. You hate doing things that don’t make your life better. That’s not selfish, that’s just common sense. If someone asks you to watch a movie that movies needs to bring some type of value to your life be it educational or entertainment. If the boring friend asks you out for a drink you’ll hesitate because you don’t want to be bored, you want to have fun! People want value and if you can’t provide it then they will find someone else that does. On top of that, I’ve created a free guide to Pinterest for bloggers. I try to deliver value like Mother Earth delivers oxygen. Sure I sell courses and other things, but when you think of Obstacle.co, the first thing that should come to mind is value. So how can you deliver value to your audience? Well, first it has to come from your blog. If your blog posts are weak then why should they stick around for anything else? Next, comes the emails that you send them. It’s great to build a mailing list that makes you money, but it can only make money if people don’t mind being on it. If you’re sending them 10 awesome emails and 1 sales email they won’t mind. If the ratio is reversed then it turns into the friend that is always asking for money and never doing any favors in return. What this all boils down to is your mindset. Too many bloggers write for themselves instead of their audience. They create things because first and foremost they want money and helping people out is a distant second. Everything you do is for your audience. If you keep that in mind you’ll do pretty well. Now that you understand the importance of providing value next you need to focus on your message. In Cultivate Your Tribe this is referred to as your Why. Finding out the Why for your blog is important because it is how you develop an emotional connection with your audience. I believe that life is happier when you have the ability to create the lifestyle that you want. Everything that I do revolves that message. Every blog post, every tweet, and every pin. My goal is to help you achieve the lifestyle that you want through blogging. If that message doesn’t resonate with you then you won’t want to be here and that’s okay. The message is supposed to draw everybody in, just the people that truly belong in your audience. To figure out the Why of your blog so you can be sure to craft a message that has an emotional pull, think about what wakes you up in the morning. Yes, you blog to make money, but that isn’t what will push you through the times where you want to give up. Thinking about how I can help people achieve their dreams pushes me to write a new post and send a new email. What is driving you to blog? You know what I hate about politics? Politicians lack consistency with their message. Every time they speak they craft their message to fit the audience listening. If you aren’t consistent in delivering your message then how can you expect it to stick with people? You have to be consistent in what you say and you have to be consistent in getting it out there. Some people will mistake this for thinking they need to post every single day to their blog and you don’t need to. Some of the bigger bloggers only post a couple times a week, but when they do it is consistent with their message and they don’t disappear for months. Their audience knows that when they read something from that blogger it will deliver a specific message. They also know when to expect to hear that message from the blogger. Have an email list? Do you only send them an email when an idea pops up? That’s pretty jarring. I hate receiving an email from a blogger that I haven’t heard from in forever. I forgot that I even subscribed to them! Be consistent in your message and be consistent delivering it. The best thing you can do for your blog is setup a content schedule. This helps you stay on track with your content and ensure it isn’t sporadic. What value will people get if they only read something from you every few months? With regard to your mailing list, you should have email sequences setup and maybe do one broadcast a week. I like to do mine on Sundays. I call it the Obstacle.co Digest. I’m pretty witty. Could you imagine if you had to pay to access this post? You wouldn’t. I wouldn’t. So give out a lot of free things. Blog posts. Ebooks. Workbooks. Worksheets. Checklists. Courses. Give them away for free. People will thank you and they will remember you. Giving away stuff does a lot of great things for you. The next question then becomes how much do you give away and what do you keep for paid products? That is a good question and I don’t really have an answer for you, unfortunately. The way I approach it is first I make sure that what I’m giving away actually provides value. A single PDF with a list of things isn’t going to do it for me. After that, I just aim to give a nice summary of something and in the paid version I go more in-depth. Paid is the actual movie. You have to show growth. What this means is that as your audience follows you are you teaching them new things or are you simply rehashing the same stuff from last year? Your new audience can look at your old blog posts, but the old audience wants new things to stay engaged. They need things that will help them grow along with you. Of the 5 keys, this one is probably the easiest to implement because it happens naturally. As you blog you want to write about new things just as much as people want to read about them. That doesn’t mean you are writing about a new niche, but you are going deeper into the topics you already cover. Go to your favorite blogger and go through their archives starting at the beginning. You’ll notice a growth in their writing and the experiences that they share. You’ll see a change taking place. To keep your audience engaged they will need to see that from you. Are you going to provide that for them? 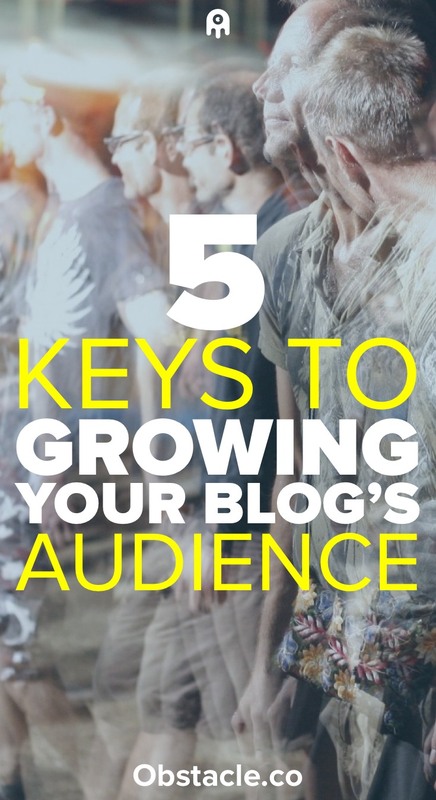 You don’t get what you don’t ask for so I’m asking you to take a second to share The 5 Keys to Growing Your Blog’s Audience with your audience. They respect great content.